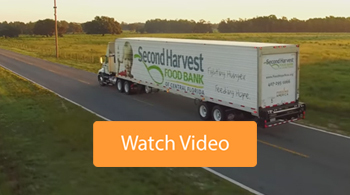 What areas does Second Harvest serve? Who is hungry in Central Florida? What else does the Food Bank do besides provide food? How does the Food Bank help in a natural disaster? What is the Food Bank’s connection with Feeding America? How can I apply for SNAP? How does an individual sign up to volunteer? How can I sign up my group to volunteer? Can the Food Bank accommodate volunteers with special needs or a physical handicap or disability? Am I able to start a virtual food drive? Does the food bank need more food or money? How can I donate money online? 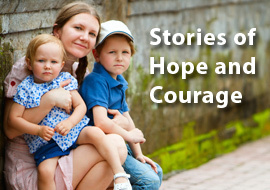 Can a $10 donation make a difference? What if I want to support my local branch? How can I become a partner agency? We distribute food out to six Central Florida counties: Brevard, Lake, Orange, Osceola, Seminole and Volusia. 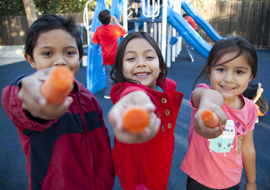 Click here to learn about who is hungry in Central Florida. Food comes to us from farmers, grocery stores, retailers, distributors, wholesale, and other food industry sources. In addition, kind-hearted members of our community hold food drives that bring in tons of food. Click here to learn about how food gets to our facility. We partner up with 550 local emergency food assistance programs to get food to the people who need it the most. Second Harvest Food Bank plays a vital role in responding to emergencies such as floods, tornadoes and hurricanes throughout the state. 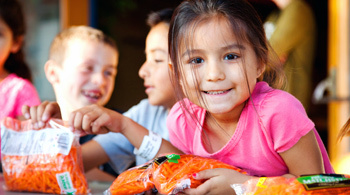 As an affiliate of Feeding America, Second Harvest responds to both national and local disasters that take place. Second Harvest Food Bank is a member of Feeding America, a nationwide network of more than 200 food banks that helps feed people across the country. Click here to learn more about this network of food banks. If you need immediate assistance, please call us at 407-295-5009. You can also fill out our food assistance form and we will get back to you with a list of feeding programs near you. If you need assistance during the weekends, please call United Way's 2-1-1. 211 provides free and confidential information and can also help with food, housing, employment, health care, counseling and more. You can apply online for SNAP benefits here. 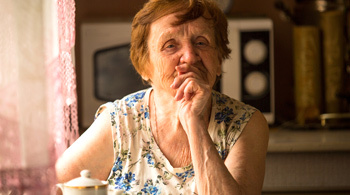 Second Harvest's Benefit Connection team can also help out with SNAP application assistance. Click here to view where our Benefits Connection team will be located in Orange and Brevard County. View a list of upcoming volunteer opportunities and sign up for a shift by going to our online volunteer management website. After you click on the opportunity that still has slots available- there is a SIGN UP button on the bottom that will take you through the registration process. If you are interested in a specific volunteer date or have a question, please contact Mindy Ortiz at mortiz@feedhopenow.org or via phone at 407-514-1043. Volunteers have to be at least 10 years old with a chaperone who is 18 years or older in order to help out in our facility, 16 years old without a chaperone. We also now have a "Family Night" or a "Family Day" for families with children ages 5-9 years old. If you have five or more individuals volunteering together, we encourage you to sign up as a group. Just go to our online volunteer management website to view shifts that are available. Place your mouse over the opportunity that you are interested in and it will let you know if any slots are open. Once you find an opportunity for your groups, email Mindy Ortiz at volunteers@feedhopenow.org the following info: 1. Name of group. 2. Number of volunteers in your group. 3. Volunteer opportunity date and shift. Then, just wait until you receive an email from Mindy confirming your group volunteer shift. Can Second Harvest accommodate volunteers with special needs or a physical handicap or disability? Yes, please contact Mindy Ortiz at mortiz@feedhopenow.org or via phone at 407-514-1043 to set this volunteer opportunity. We are not able to accept court-ordered community service volunteers at this time. Location two: The Lake-Maitland Civic Center is now accepting small donations at 641 S. Maitland Ave Maitland, FL 32751. Please note that this location is for smaller donations and will not provide receipts. Drop-off hours are Monday thru Friday from 9am until 5pm. They can be contacted at 407-647-2111. If you wish to do weekend drop-offs, please contact them by telephone first. We strongly advise you to call us before coming to drop off to make absolutely certain someone is on duty to receive your donation. Please do not leave food donations outside the door —there is a 100% chance they will be stolen before we can receive them. Please contact our main office at 407.295.1066 to confirm that we will be open. Yes! The Second Harvest Food Bank virtual food drive is a representational web-based tool that allows individuals and organizations to hold an online food drive. While we love donations in any form, our virtual food drive allows us to serve more clients, more efficiently. It's fast, easy and fun! Get started today. Click here to view our list of most needed items. Certainly the Food Bank needs both of these vital ingredients to be successful in helping our neighbors. It can be helpful to consider, however, that for every $10 contributed to our mission, we can distribute $90 worth of food. That’s up to nine times more food than you would be able to access at retail (or even wholesale club) prices if you bought it yourself and gave the food. And the difference becomes even more significant as the amount of a gift grows. For example, consider what the $9,000 worth of groceries made possible by a $1,000 gift might look like! It’s very simple! Click here or look for the Give Now buttons on each page of our website to access our easy online giving form to contribute in a secure way with your credit card. It just takes a few minutes to complete, and the funds will be helping provide more food right away. Hunger is a ‘one person, one meal’ at a time kind of problem. 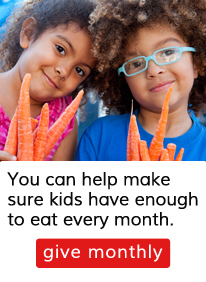 And for kids, seniors, families, veterans…literally every meal counts. Imagine a table set with 40 place settings and plates loaded with food if you would like a mental image of what $10 can do to help. Yes. Second Harvest Food Bank of Central Florida is a 501(c)(3) nonprofit organization. Contributions are tax-deductible ti the extent permitted by law. According to the formula on the IRS 990 form that Second Harvest Food Bank is required to submit each year, 97.4% of every charitable contribution received is used for programs that help feed people in need. We are very proud of this uncommonly high efficiency ratio. Depending on where you reside within the Food Bank’s geographic service area, your contribution will be used to help provide food for people in your local area. For example, gifts made by Volusia County residents will be used to support the work of our Volusia Branch operation in Daytona Beach, which serves 90+ partner organizations throughout the county. Similarly, gifts from Brevard County residents are directed toward our Brevard Branch operation in West Melbourne, which serves dozens of partner programs county-wide. All other gifts (including those made by people living outside of Central Florida) to Second Harvest Food Bank are used to support the work at our main distribution center in Orlando, which serves hundreds of partner feeding programs in Lake, Orange, Seminole, and Osceola counties. If you contribute online, or through the mail, by check or by credit card, your gift will be automatically credited to the work of our closest branch to the address we have on file for you. No additional communication will be needed in order for this to occur. Volusia residents’ gifts will support our Branch operation’s work throughout that county, and Brevard residents’ gifts will be applied to the work of our Brevard Branch operation. All other gifts will support the work at our main distribution center in Orlando, serving partner feeding programs in Lake, Orange, Seminole, and Osceola counties. You must first fill out an application form. Applications are reviewed three times each year. If you are in Orange, Osceola, Seminole, Lake or Volusia County, submit your application by the first Monday of February, May or August. Anything submitted after this period will be saved for the next deadline. Brevard County applications are accepted year round. Our staff is more than happy to help you with the application process and will be available for appointments at Second Harvest and can answer any questions via phone or email. Click here to download an application. Making a real difference for our neighbors in need is easy and can be accomplished a variety of ways. Visit our ways to help page to view all the different ways that you can help get food to our neighbors in need. Yes. Second Harvest holds tours several times during the month. During this one-hour information session you will learn more about who is hungry in our community and then take a walking tour of the food bank to see how we operate. Click here to sign up for a future tour date. If you have questions regarding Food for Thought tours, please contact Maureen Mikel at mmikel@feedhopenow.org or 407-514-1016.